NYC24.com, in its fifth issue, shows how New York City is obsessed with image - both personal and public. Our reporters uncovered the places where perception and reality conflict. We probed the boundary between where a person's image ends and where his or her identity begins. We caught New Yorkers stealing glances at themselves in plate glass windows and half-empty subway cars. We watched them pluck the most healthful-looking products from grocery shelves and apply makeup before begging for a job. We listened to they way they cheered for presidential hopefuls and examined foreign lands and unfamiliar cultures. In 11 stories, our reporters uncovered the places where perception and reality conflict. We probed the boundary between where a person's image ends and where his or her identity begins. As the issue unfolded over the last month, we began to see the world as a series of images cascading, one behind the other, layers of an infinitely complex onion that as reporters, we had pledged to peel. We canvassed Staten Island, lost tapes of DMC of Run DMC rapping against domestic violence and for NYC24, gawked at hot pants, flirted with getting a Mohawk, learned how to scrum and nearly fainted while filming eye surgery. We hope you enjoy digging beneath the image of NYC. Asian Eyelid surgery is the most popular and fastest-growing cosmetic surgery in northeast Asia — and among Asian-Americans. The surgery adds a crease and makes the eyes look bigger by slicing the eyelid open and fusing the muscle with the skin. But the procedure has been sensationalized in the media. For example, a Dr. Phil's episode, "Change My Face, Change My Race," claims that Asians are trying to “erase” their ethnic identity. Almost half of all northeast Asians are born with an eyelid fold, which has long been considered more beautiful in Asia, according to Dr. Edward Kwak, a plastic surgeon. Doctors and patients say they’re simply improving physical appearances, and that many Americans don’t understand a surgery that is commonplace among young women in South Korea and growing in China and Japan. If done well, meaning that the eye looks proportional to the patient’s face, the surgery is no more extreme than nose jobs or breast implants, some said. Felipe Ramirez is a Mexican citizen and lives in Corona, Queens. Although he cannot vote in the U.S., he is an enthusiastic Clinton supporter and has volunteered for the campaign by distributing fliers and speaking to parents of Hispanic children in area schools. He is one of a sizable number of people who are ineligible to vote but who this year have been motivated to support presidential candidates in the 2008 election. See the full story at NYC24.com. Felipe Ramirez from Channtal Fleischfresser on Vimeo. The Green Circus is coming to Astoria this weekend! Through skits and tricks, the Green Circus, a troupe of clowns, artists and teachers, aims to help create a new generation of environmentalists who will value renewable and recyclable resources, and detest power plants and other polluters. Their motto is “saving the planet one clown at a time.” Like similar acts, the group seeks to perform in every bit of open space, hoping their pro-green acts will tickle children pink. “It’s not like we do this Power Point presentation that Al Gore is standing in front of,” said Ezra Silverman, one of the members of the Green Circus troupe, referring to Gore’s documentary, An Inconvenient Truth. This brand of clowning provides a comic counterpoint to the environmental doomsday books and documentaries with laughter. Clowns tackle environmental causes, tickle audiences is a multimedia story produced by Sydney Beveridge, Dave Burdick, Tom Davis and Matthew P. Moll for the Hijinks issue of nyc24.com. If you're longing to re-do the time you were ousted in that grade-school spelling bee, pulverized in debate class, or left in outer orbit in Solarquest (my childhood favorite). Now is your second chance. And you can play games while sipping cocktails in bars! Board games, spelling bees, debates and quiz nights are already standard fare during off-peak nights in New York City bars, but attendance to bar games has become more popular with the rise of online game playing. Web sites like Pogo.com and Yahoo Games, which feature online versions of classic board games and new online gaming applications like Scrabulous, have revitalized interest in playing games in real life, or at least made them cool enough to headline nights at local city bars. Did you know that "hijinks" is the only word in the English language with three consecutive dotted letters? Super nerdy. For more, check out Nerdy Games Rock Bars, a multimedia story produced by Lisa Biagiotti and Lauren Feeney for the Hijinks issue of nyc24.com. Most of the nerdy bars we found are in Manhattan and Brooklyn. Are there any intellectual games in Queens' bars? Last night, Flux Factory, an artist collective in Long Island City, unveiled its final exhibition,"Everything Must Go." Art installations spread out across bathrooms, bedrooms, and even the laundry room of this 7,500 square-foot space, which is set to be demolished to make way for MTA expansion. Lisa Biagiotti and Kenan Davis produced and edited the following video on Flux Factory's opening night, which marks a month-long goodbye to 38-38 43rd Street. Flux Factory began as an art community in Williamsburg in 1994. The community moved to Long Island City in 2002 and currently has 18 artists-in-residence. The building will be demolished to make way for the MTA's East Side Access Project. While this is the last exhibition, artists are scheduled to move out sometime during the summer. City Picklers: Reviving local food, one pickle at a time, has launched its multimedia website. In the age of pre-packaged, processed food, who would bother to take the time to pickle? But in New York City, mason jars bubble over on home counter tops, hand-crafted pickles line the aisles of gourmet grocery stores and fermentation newbies are raising glasses to salute the pickle. CityPicklers.com is a website devoted to New York pickles--in all varieties, including vinegar, lacto-fermented, Jewish, Indian, Chinese, and so on. Every culture has its pickle, and we found that pickling still thrives in the historic pickle district on the Lower East Side, in ethnic enclaves of the outer boroughs, in farmer's markets and in pickling classes. The site is best viewed in the Firefox browser. We'd like to thank the more than 70 chefs, cookbook authors, historians, purveyors and picklers we interviewed over the last six months. Who are the women behind the wheel? Johanna Gomez, Humera Mian, and Maria Helena Hormaza have two things in common. They all live in Queens. And they all drive N.Y.C. yellow cabs. Johanna holds a degree in Digital Filmmaking and is driving to pay off her loans. Humera is a single mom from Pakistan who drives in order to support her five children. Maria Helena left an international merchandising business to be closer to her family in New York and now drives a cab. Female drivers make up 155, or 0.3 percent, of the 45,900 licensed drivers in the city. Most women would shy away from such a stressful line of work in such a male-dominated industry. What is it about these women that led them to decide to drive cabs? "Women in Transit," seeks to answer that question, focusing on Johanna, Humera, and Maria Helena. Meet these women at womenintransit.com. 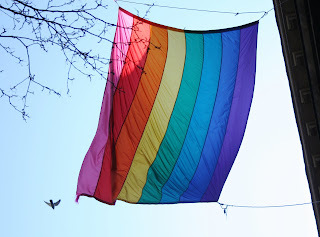 Gay immigrants who come to the United States often do not know they have an option to apply for asylum based on persecution from sexual orientation. One resource for many of these immigrants is the Aids Center of Queens County, or ACQC, which serves 5,000 people infected with HIV in eight locations throughout Queens. ACQC's services and food and clothing pantries are not limited to those infected with HIV, but are open to all in need, including gay asylum seekers, according to executive director, Phil Glotzer. Today, immigrants fleeing persecution are applying for asylum in fewer numbers as deportation rates are increasing. Heightened immigration controls have made it harder for immigrants to obtain visas, and many who are eligible do not apply for asylum because they fear being deported if their application is rejected. Seven years ago, Dane Solomon fled his native country of Guyana, leaving his son and family, never to return. In the years since, he suffered a stroke, beat brain cancer, and coped with HIV, poverty and the uncertainty of being undocumented in New York. "I lived in constant fear that I would not be able to put up this facade," Solomon said. "Knowing who you are inside and pretending to be somebody else takes everything from you." We tell Solomon's story, Dane Solomon is No Longer Afraid, in the Space Issue of nyc24.com. The multimedia story presents videos and resources on U.S. asylum trends and the challenges facing immigrants within the LGBT community. Junction BLVD is edited by multimedia journalists Lisa Biagiotti and Channtal Fleischfresser. Junction BLVD is currently accepting submissions for stories on life in Queens. Please e-mail stories to junctionBLVD@gmail.com.